If you’ve worked at a web development company with many clients I’m sure you’ve had a bunch of different domains for each of the various sites. Creating the DNS entries for each of the different sites can be a pain, and after a while I’m sure you get to the point where trying to cleanup unused DNS entries would be a nightmare. The cool thing is that there is absolutely no configuration needed for any of this to work. Basically the DNS server will pull the IP address from the URL, and return it to your browser. If you’re a system administrator that manages the DNS for your company that would mean you’d no longer need to create DNS entries for your developers, which can save a huge amount of time if you have new sites always popping up. 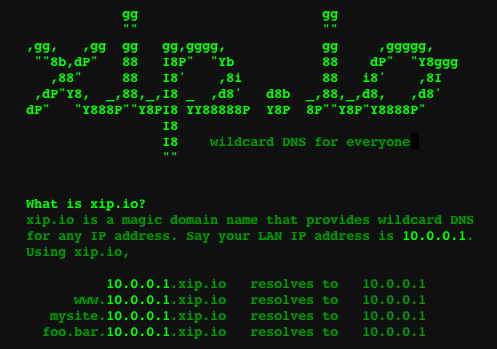 The service is completely free and you can start using it without ever even visiting the xip.io site. A big thanks to the fine people over at 37signals for putting this together.